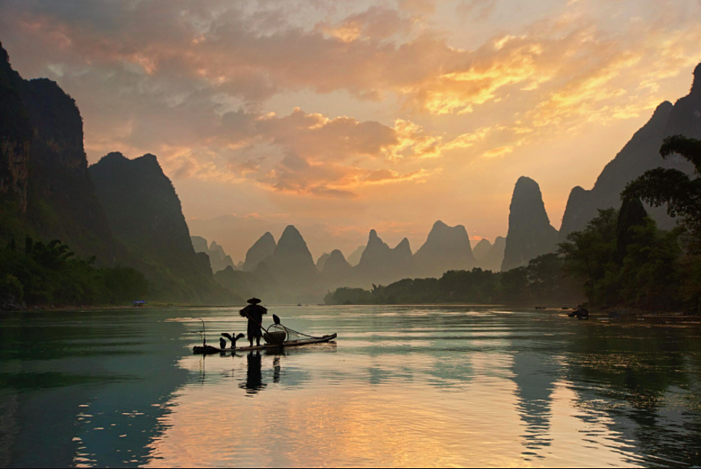 A fisherman with a cormorant on a bamboo boat, sandwiched between beautiful mountain shapes. This is one of the most iconic images of the countryside in China. In fact, this image appears several pieces of Chinese currency. The Li River is located south of China in the Guangxi province, not too far from Hong Kong. Hunan is worth a visit for the food alone (it is one of the 8 big regional cuisines of China.) 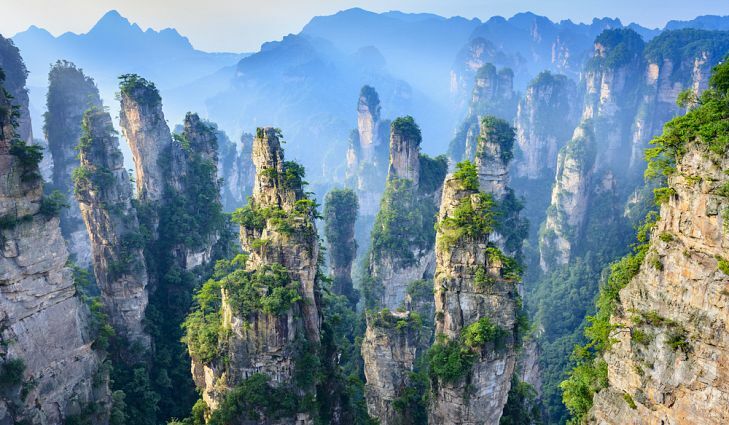 However it is also home to ZhangJiaJie National, a Unesco World Heritage site, and the inspiration for the floating mountains in the movie Avatar. The park has been extremely popular, but exploring further in some of the various hiking trails will take you away from the crowds. 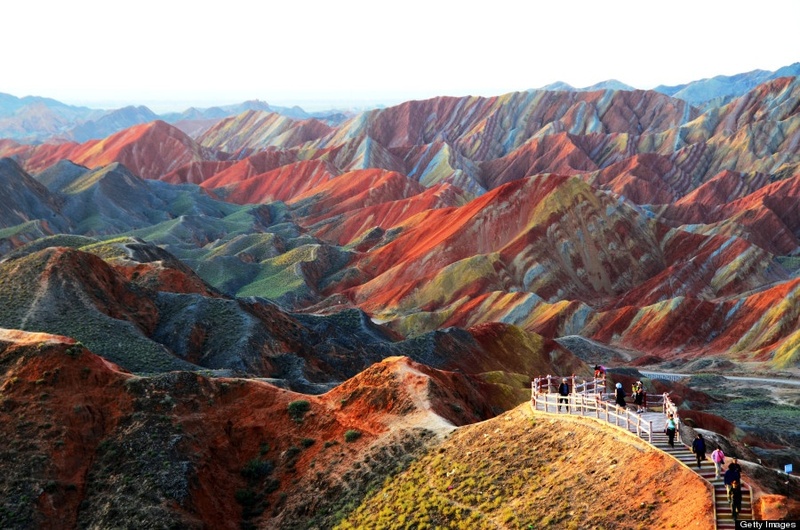 The mountains in Zhangye Geological Park in Gansu look like they're from a fantasy planet. The layers and colors are formed by different minerals being pressed up against each other over millions of years. 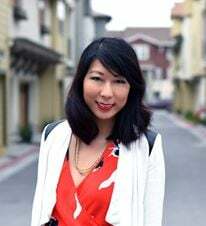 Summer is the best time to visit, since the area can be uncomfortably dry and windy in the winter. The Great Wall is, of course, one of the identifying marks of China. It is a stunning manmade marvel in any season, and there's now even a segment submerged underwater that allows scuba divers to "dive the Great Wall." Matt Damon even starred in a movie of the same name. The wall was built by the first Emperor to keep nomadic intruders out. 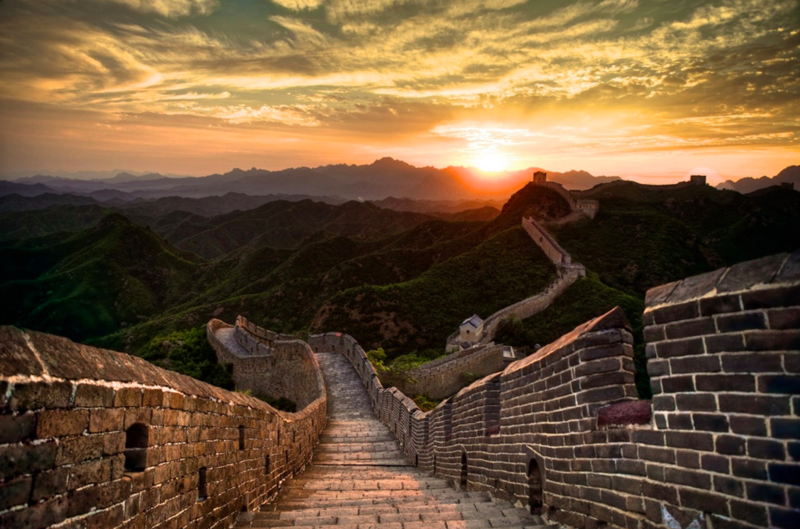 You can visit the various parts of the wall from different areas in China, but the most well known tourist sites are in Beijing. 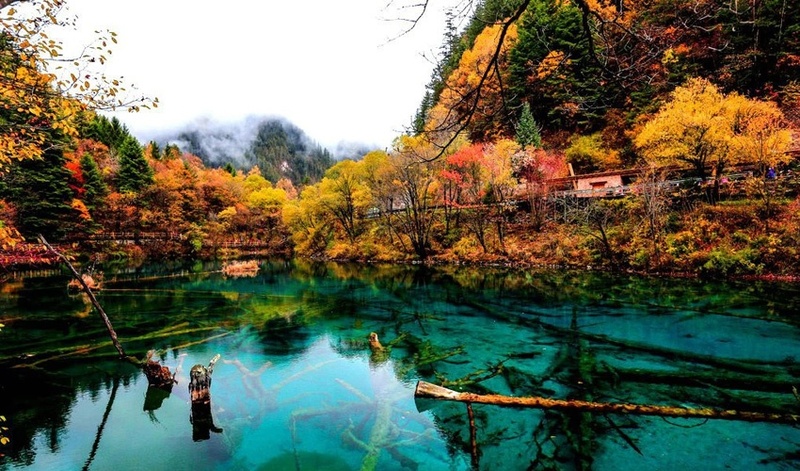 Sichuan province is home to a rather underrated National Park called JiuZhaiGou. The park boasts stunning turquoise ponds and beautiful tree foliage. The best time to visit is the fall, when the leaves change to fiery tones of autumn. 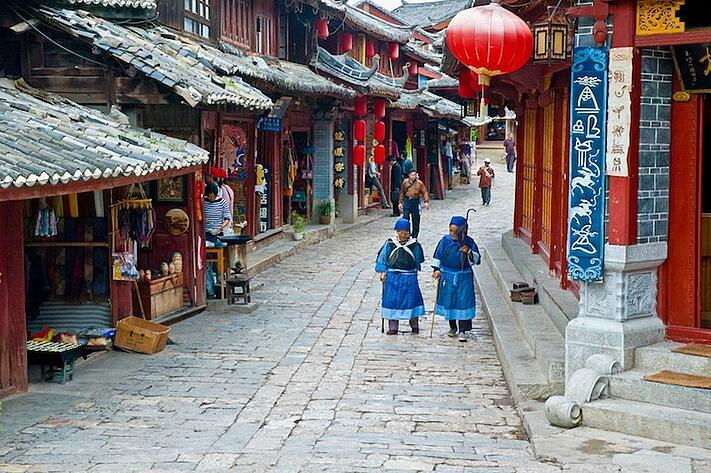 The ancient town of LiJiang is known for its charm. It has retained the architecture and layout from hundreds of years ago, when it was known as a trading town. The water system in the town was an engineering marvel in its time, as it divided a main river into multiple tributaries to deliver water. Any person will tell you that rice is a huge part of Chinese cuisine. In fact, China accounts for nearly 30% of all rice production in the world. 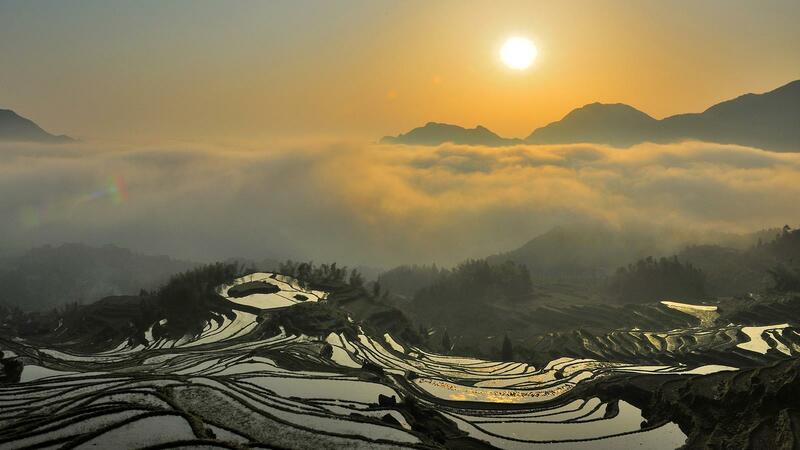 The YunHe rice terraces are not only functional, but beautiful. It is recommended to visit in the spring and summer when the rice terraces will be filled with water, to get that mirrored effect. Snow on the terraces is also a beautiful sight to behold. 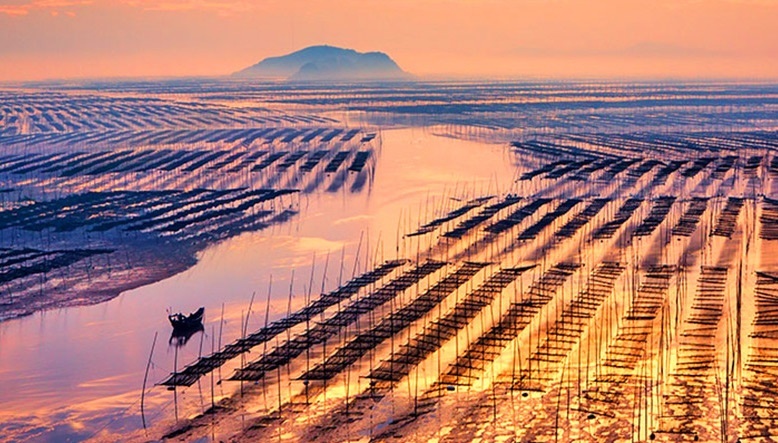 A mudflat doesn't sound like a particularly stunning destination, but this one in Fujian has become a cult favorite among photographers. During the seaweed harvesting season, the workers let the kelp dry on fences in the water, creating beautiful patterns. Sunsets are legendary on the calm mirrored waters. Which one was your favorite? Are there any places that you think should've made our list? Let us know!